In view of a possible escalation of violence between actors that have been supported by the international partners in their fight against the Islamic State in Iraq over the past three years, Germany will have to examine its role and the continuation of its support for the Kurdish Peshmerga: Priority should be given to the already started process of integration of the Peshmerga fighters and to the abolition of separate party and private militia structures rather than to a continued strengthening through weapon deliveries and training. Measures such as weapon deliveries and training change the initial intervention context of a conflict situation radically by shifting local power relations. A critical analysis of the effects suggests that military support and enhancement measures must be accompanied by the civilian support of democratic processes. 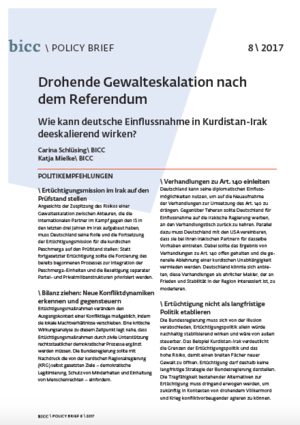 The German government ought to call on the Kurdish regional government (KRG) to meet the goals it has outlined in the past: Democratic legitimization, protection of minorities and the protection of human rights. Germany can use its diplomatic influence to push for negotiations on the implementation of Article 140 of the Iraqi constitution (realization of a population census and referendum in the disputed territories). Germany should use its diplomatic channels towards Teheran to influence the Iraqi government to re-join the negotiations. Further, Germany ought to negotiate with the United States that they stand in for the same goals with their Iraqi partners. Negotiations over Article 140 should be result-oriented and not in avoidance of Kurdish independence. Germany can offer to moderate these negotiations as an honest broker that is interested in peace and stability in the region. The German government must give up the illusion that military enhancement and support measures alone lead to sustained stability in contexts of violent conflict and that it has complete control over the weapons deliveries and training. The example of Kurdistan–Iraq demonstrates the limits of military enhancement and support measures and the high risk of opening Pandora's box. This is why the German government should refrain from implementing this policy as a long-term strategy. The viability of existing alternatives to military support measures must be urgently considered so that in future the international community can react more effectively and prevent conflict in situations of imminent genocide and war.